Traditional White Board graphics are, well, plain. They are usually black and white and seem a little devoid of detail. Even some of the color drawings look weird when your White Board animation software starts drawing them. Ever notice that the hand is all over the place, instead of looking like it is drawing each individual line in the drawing? How often do people draw every dot in a row, rather than drawing each line in a sequence? A lot of SVG graphics do not take the software into consideration. They simply turn their graphics into an SVG and let you deal with the results. That wasÂ the white board graphics standard… until the launch of SVG Galaxy! 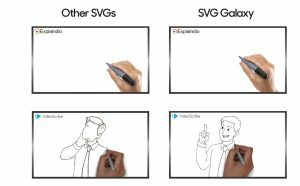 SVG Galaxy is a collection of white board graphics that are created especially for animation software like Explaindio, Easy Sketch Pro and Video Scribe. The SVG actually tells the software how to draw the graphic in a way that looks natural – and it makes a huge difference in your videos! How To Boost Conversions By 377 Percent! Grabbing Eyeballs With Animated Infographics!